Last June, President Donald Trump signed a landmark law on veterans’ health care after months of tense negotiations. 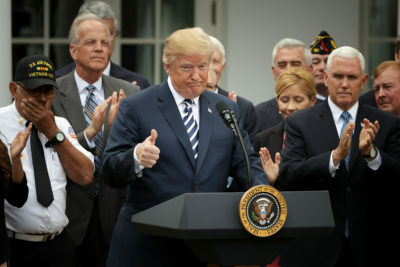 At the ceremony in the Rose Garden, Trump said the bill would deliver on his campaign promise to let veterans see private doctors instead of using the Department of Veterans Affairs’ government-run health service: “I’m going to sign legislation that will make veterans’ choice permanent,” he said. Standing behind him, the leaders of major veterans groups looked around uncomfortably. What Trump called “choice” these veterans groups called “privatization,” and they’d been warning for years that it would cost taxpayers more money and deliver worse care for veterans. The veterans groups had endorsed the bill, but Trump’s description of it was not what they thought they were there to support. The moment left no doubt that the Trump administration is determined to use the new law to expand the private sector’s role in veterans’ health care. The administration is working on a plan to shift millions more veterans to private doctors and is aiming to unveil the proposal during Trump’s State of Union address in January, according to four people briefed on the proposal. The people spoke on the condition of anonymity because they weren’t authorized to disclose information about the administration’s plans. The cost of expanding private care is hard to predict, but VA officials have told Congress and veterans groups that it will range from $13.9 billion to $32.1 billion over five years, the four people said. Since the administration opposes lifting overall government spending, Democrats say the increased cost of private care will come at the expense of the VA’s own health system. Some lawmakers said the administration’s plan defies the purpose of the law they passed. Trump’s first VA secretary said he was forced out by ideologues determined to privatize the department, which he called, in a New York Times op-ed, “a political issue aimed at rewarding select people and companies with profits, even if it undermines care for veterans.” The new secretary has repeatedly denied that privatization is the administration’s goal. But the fact is that Trump is doing exactly what he said he would do: The share of VA care delivered in the private sector has grown to 36 percent from 22 percent in 2014, and the administration is weighing policy changes that would move up to 55 percent of veterans to private providers, according to the people briefed on the deliberations. As a candidate, Trump spoke often about improving veterans’ care, and as president, he has returned often to that rhetoric. At his post-midterm press conference, he said, “I’ve done more for the vets than any president has done, certainly in many, many decades, with choice and with other things.” But he has plunged the VA leadership into turmoil and stirred anxiety over privatization, which many veterans oppose. And just this week, he was criticized for not participating in any public events on Veterans Day. The VA has been purchasing private care to supplement its health system since 1945, and there’s broad consensus that doing so makes economic and medical sense in many instances. But in recent years, conservatives such as the Koch brothers have made it a political priority to shift more veterans to private doctors, under the banner of choice. In 2014, after a scandal over long waits for appointments at the Phoenix VA, Congress created a new program, called Choice, to send veterans to private doctors if they would have to wait more than 30 days for a VA appointment or lived more than 40 miles from a VA facility. By the start of the Trump administration, the Choice program was running out of money and suffering from payment and scheduling problems. 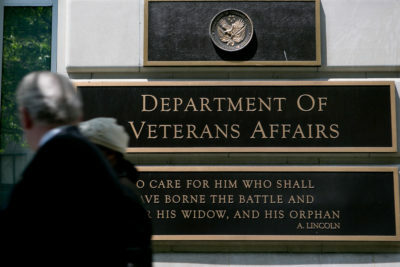 Lawmakers got to work on overhauling the program and consolidating the VA’s various channels for buying private care. Sen. Jerry Moran, R-Kan., wanted to establish across-the-board guidelines, known as “access standards,” for when veterans could see private doctors. When the Senate veterans committee took up the proposed amendment, all the members, Republican and Democrat, voted against it, except Moran. Despite the committee’s 13-1 rejection, Moran’s proposal found a key ally in the White House: Darin Selnick, who used to work at a group backed by the billionaire brothers Charles and David Koch called Concerned Veterans for America and had signed onto an infamous proposal to dismantle the VA health system. Officials in the VA, then led by Secretary David Shulkin, warned in meetings with lawmakers that what Selnick and Moran were seeking to do would explode the government’s costs by $60 billion to $80 billion a year, forcing the VA to cannibalize its own health centers to pay for private care, four people involved in the talks said. But a bill to overhaul the Choice program couldn’t move forward without the White House’s support. So lawmakers struck a deal, according to four people involved in the negotiations. They adopted the access standards from Moran’s failed amendment, but added the word “designated.” That word meant the VA secretary would have the authority to decide, or “designate,” which access standards would make veterans eligible for private care and which were merely guidelines. VA officials reassured Democrats that Shulkin would designate only three access standards, limiting the circumstances when veterans would automatically get referred to the private sector, the people said. Moran and Selnick, meanwhile, successfully got access standards into the bill. According to the people involved in the negotiations, both sides walked away thinking they would have their way later on, in the implementation. With a looming deadline to act before the Choice program ran out of money, the compromise bill, now known as the VA Mission Act, gained the support of traditional veterans groups as well as conservative groups like Concerned Veterans for America. The nonpartisan Congressional Budget Office analyzed the bill’s cost on the assumption that it wouldn’t significantly increase the rate of veterans going to private doctors. But soon after the Mission Act became law, the White House made clear that it opposed increasing the VA’s funding in order to pay for it — exactly as House Democrats had warned. “This funding can and should be provided within the existing non-Defense discretionary spending cap, and the administration opposes efforts to increase or adjust the cap,” Office of Management and Budget director Mick Mulvaney and then-acting VA secretary Peter O’Rourke said in a July letter to Congress. Rick Weidman, the policy director for Vietnam Veterans of America, said Trump was breaking his campaign promises to veterans by refusing to fund the law he signed. “He got all the plaudits, then said we’re not going to pay for it,” Weidman said. The same people who were pushing for more private care during the legislative negotiations are now the people leading the Trump administration’s implementation of the Mission Act. Selnick briefly returned to Concerned Veterans for America before becoming an adviser to the new VA secretary. Selnick was replaced in the White House by Drew Trojanowski, a former aide to the late Sen. John McCain, R-Ariz., who worked closely with Moran on the access standards proposal. It isn’t surprising, then, that Selnick’s interpretation of the bill has gained the upper hand: The VA is planning to “designate” all the access standards as making veterans eligible for private care, according to veterans groups and congressional staff briefed on the plan. Congressional aides said that would expand the use of the private sector much more than they expected. Selnick did not respond to a message seeking comment. 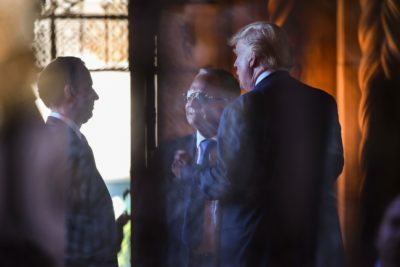 The three Trump associates who’ve secretly steered the VA from Mar-a-Lago have also supported spinning off VA medical services to private providers. 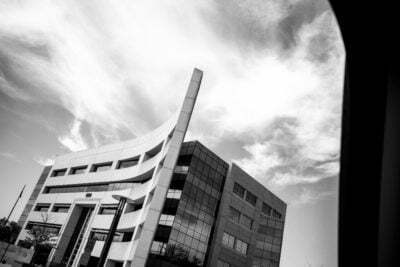 In a September 2017 email, the trio’s chief, Marvel Entertainment chairman Ike Perlmutter, proposed inviting private health executives to help the VA divvy up services that should be outsourced to private facilities. The new VA secretary, Robert Wilkie, said he never discussed privatization with the Mar-a-Lago trio and he’s not aware of any ongoing contact with them. The VA official who’s currently running the Mission Act implementation, Assistant Secretary for Enterprise Integration Melissa Glynn, came from the same consulting firm as another member of the Mar-a-Lago trio, lawyer Marc Sherman. Sherman didn’t initially put forward Glynn’s name, but he did recommend her for the job, according to a person with direct knowledge of the matter. Glynn and a representative for Sherman declined to comment. The Mission Act gives the VA until March to finalize the new access standards. Wilkie has not yet advanced a proposal to the White House and has rejected several drafts, three people familiar with the process said. Yet the access standards that Wilkie is considering could dramatically expand the VA’s use of private care, according to recent VA briefings to Congress and veterans groups. The numbers are hard to predict because more veterans might switch to using VA benefits instead of Medicare or private insurance if the VA would pay for them to see private doctors with no copay, and private doctors might bill the VA for more services because they’re paid by volume (whereas VA doctors are salaried). A 2016 commission on VA health care founded that if veterans could see private doctors without first getting a referral from the VA — because, for example, the VA failed to meet certain access standards — costs could increase by $96 billion to $179 billion a year.